I am very disappointed with my authentic version of the Lapis legit because the color tone for each layer are not even.. 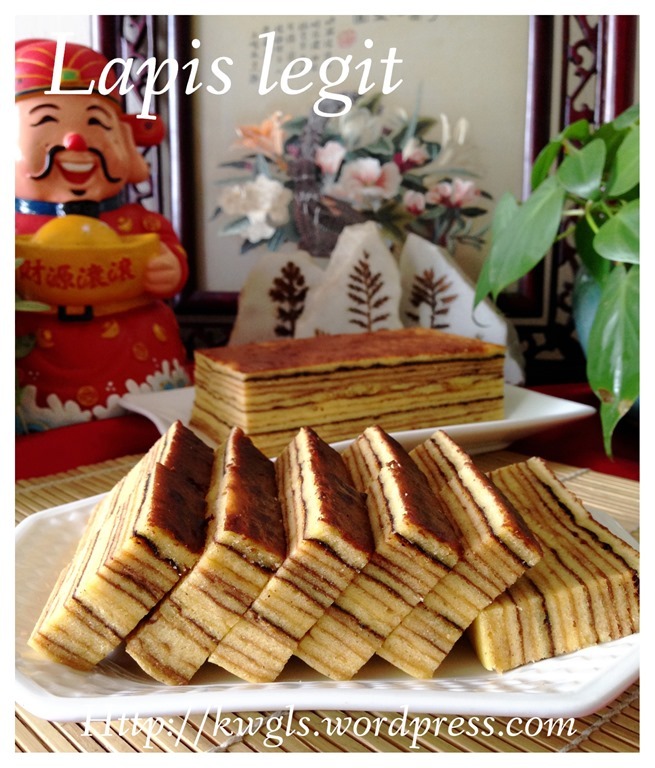 Sorry for being not humble to say that I know I can do much better than this as baking lapis is nothing new to me. I have to tell all readers frankly that some layers are slightly burnt. 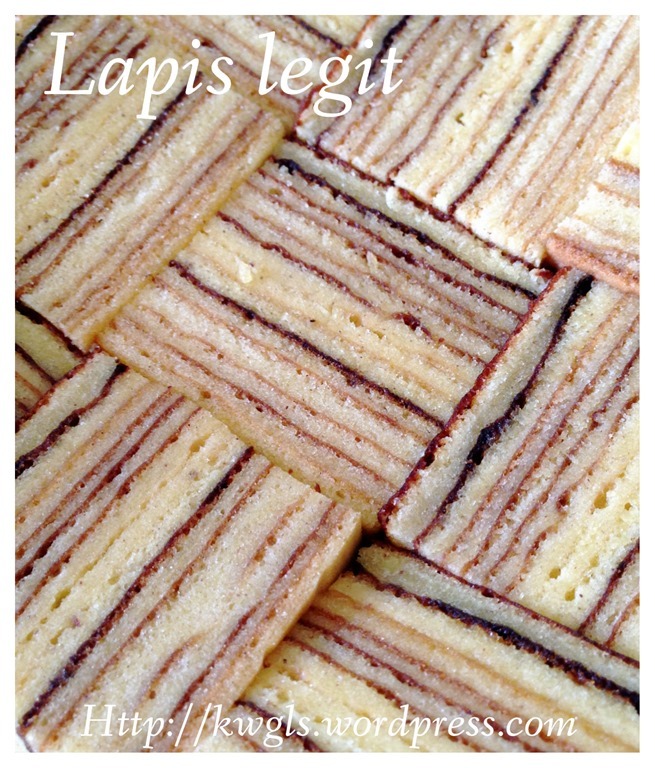 and those layer with a very dark lines are those that are burnt..However, I knew the exact reasons and if you follow this recipe closely, your lapis will definitely look much better than the one in this post. 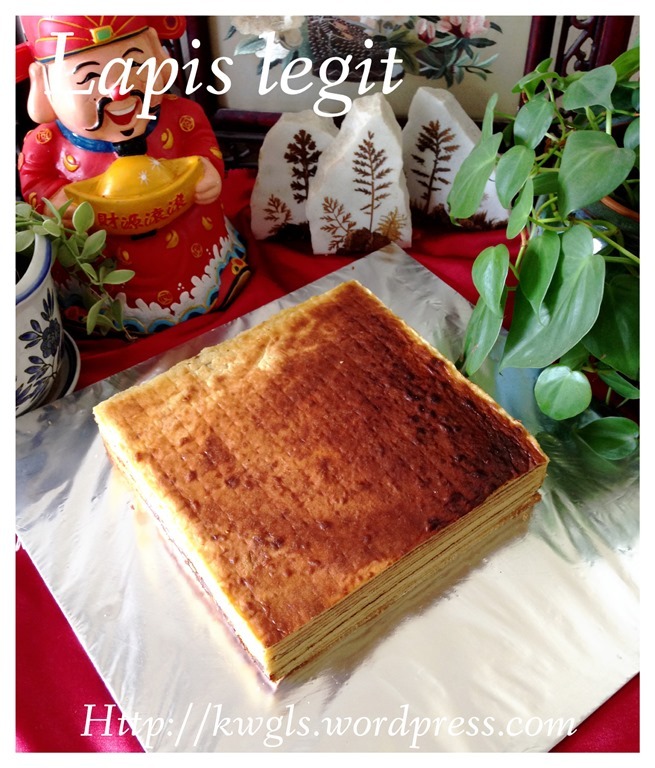 The reason that I proceed to issue this post is because I do not foresee I will be preparing this cake in the very near future… Well, it is a very delicious cake but it is just too taxing for my body with the rich ingredients.. So, shall the readers bake this cake? Sure, why not? 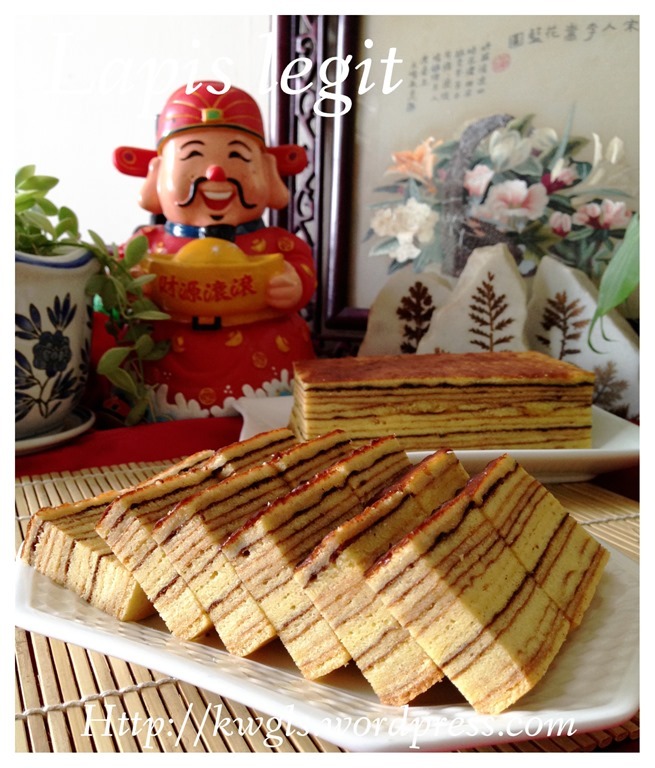 Bake and give it as Chinese New Year gift and it is definitely a presentable gift. 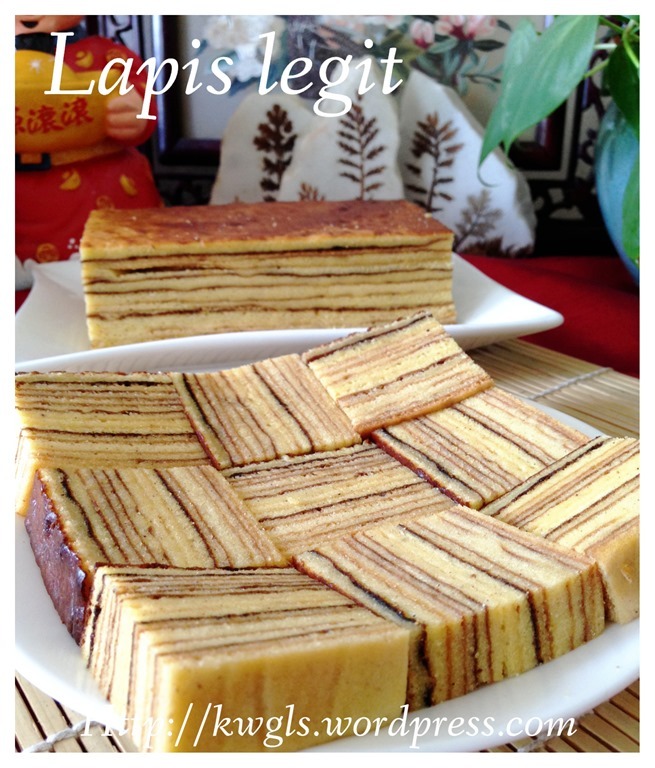 If you ask me whether preparing lapis is difficult or not? I will say NO if your oven is normal.. Is it very time consuming? I have baked numerous times and I do have a way to enjoy the process. However, it did not apply to this bake because of the fluctuating oven temperature and I have to monitor closely every layer.. Being a poor blogger without any helper, I need to clean the kitchen and cooking utensil myself after every bake. For the first 1-2 layers, I will generally monitor the progress. from the third layer onwards, I will start dishing and cleaning the kitchen. By the time the cake is done, my kitchen is cleaned too. How long does it take? Possibly 20 layers times 5 minutes = 1 hour and 40 minutes.. If you think that it is time consuming, why not bake 2 cakes at one go.. or even 4 cakes (top 2 and bottom 2). But you have to rotate the baking tin systematically and it basically means that your oven door is always open which is okay since what you need is basically top grilled heat to brown the layer. 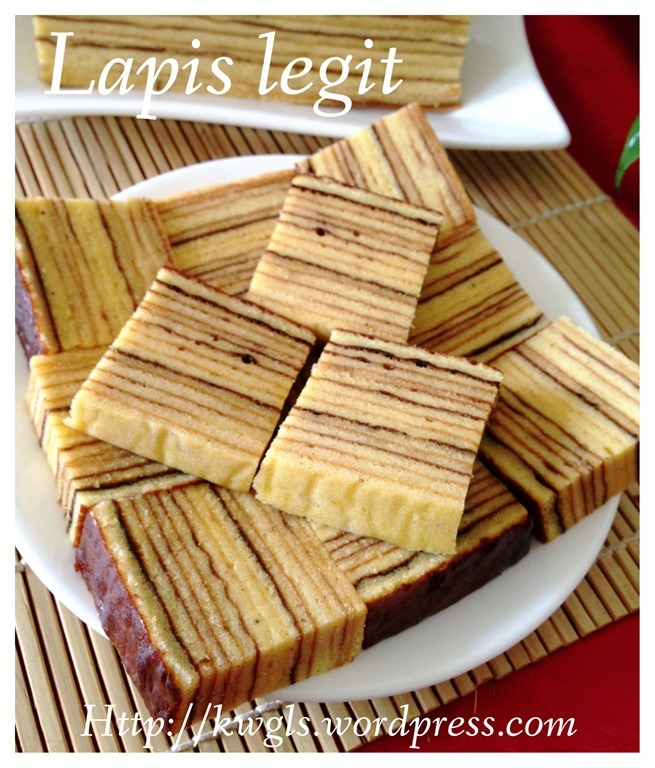 Why lapis need so much butter and egg yolk? The answer is very obvious, it is a cake that requires high temperature to bake with long baking hours, the cake will be dry if you use whole egg or less butter..Egg yolks and butter do make the cake “moister”. Crack the eggs and keep the egg yolk. 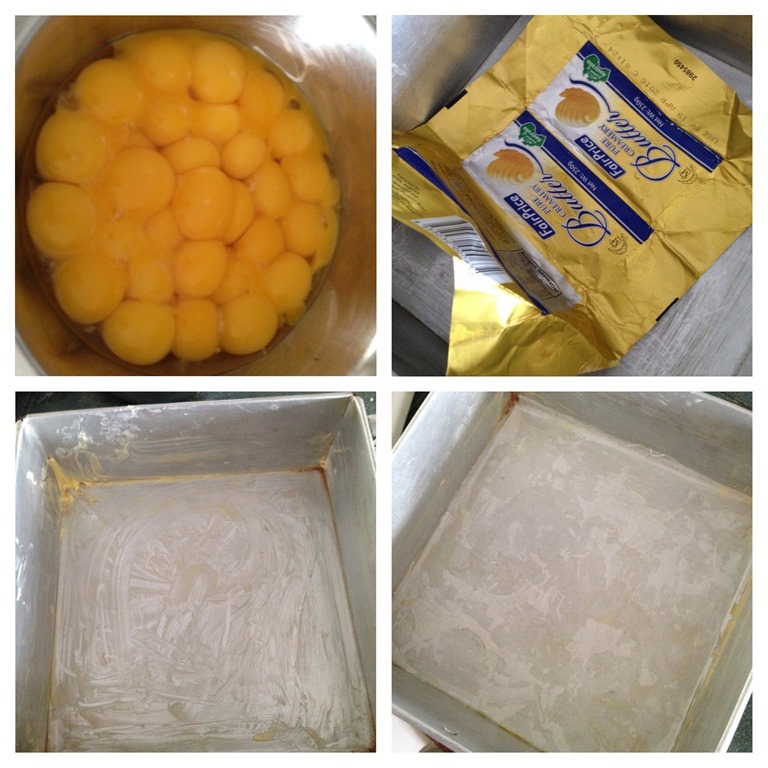 You can freeze the egg whites for recipes such as angel food cake, meringue nest, egg white biscuits, Pavlova etc.. Grease the baking tin adequately with butter. 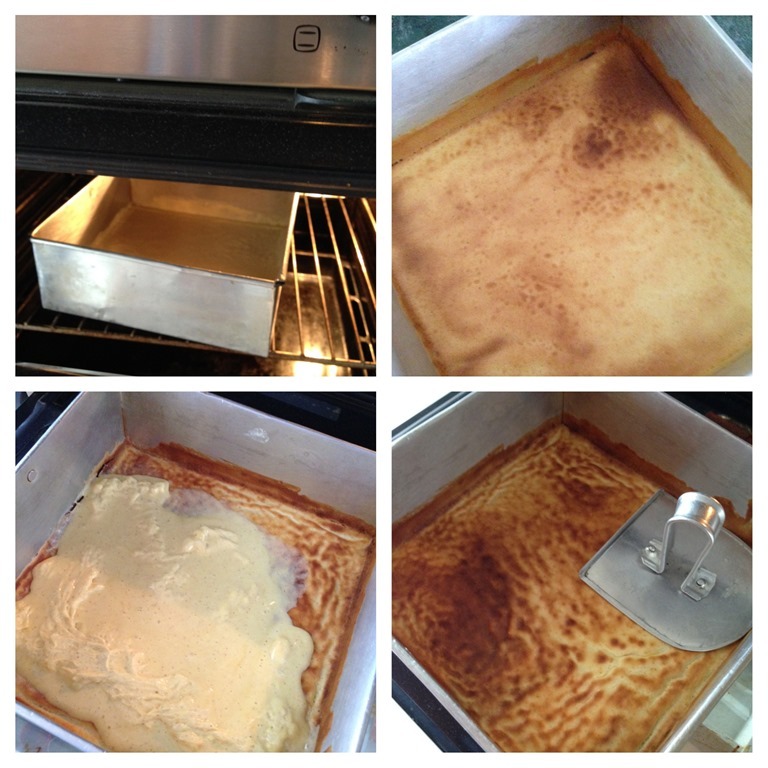 Place a piece of baking paper at the bottom of the baking tin. Beat the butter, condensed milk and icing sugar until light and fluffy. Sift in the cake flour and mixed spice. 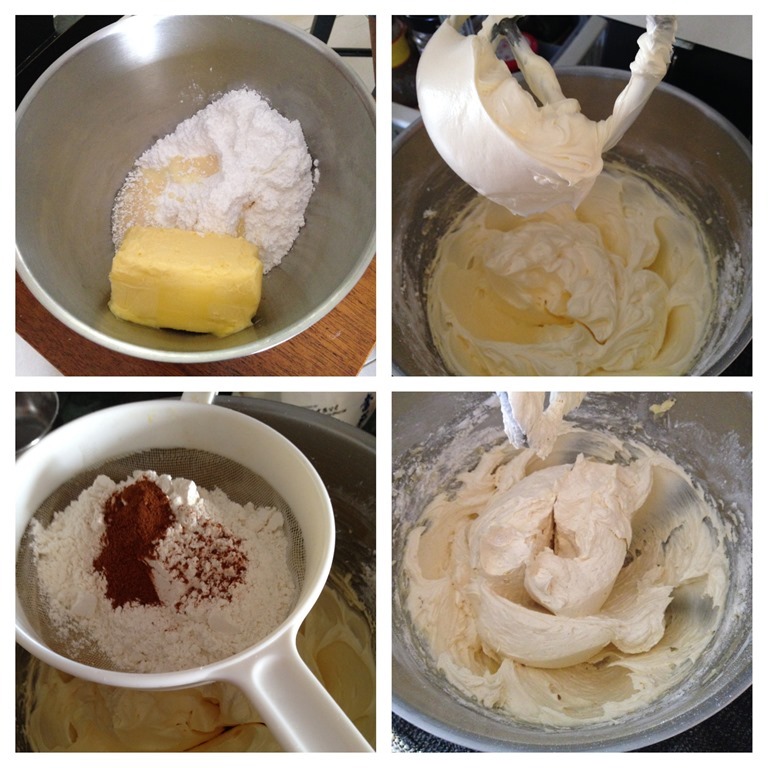 Use the standing mixer’s lowest available speed to mix for 1 minute or until well mixed. Pre-heat the tin in the preheated oven of 180 degree Celsius for 2-3 minutes. Once done, TURN THE OVEN TO TOP GRILLING MODE. Place about 1/2 cup of the batter to the baking tin. Put it back to the oven for about 15 seconds to let the heat melt the batter, swirl around the tin to make a thin layer. Bake in the oven for about 5 minutes or until the top part starts to brown. 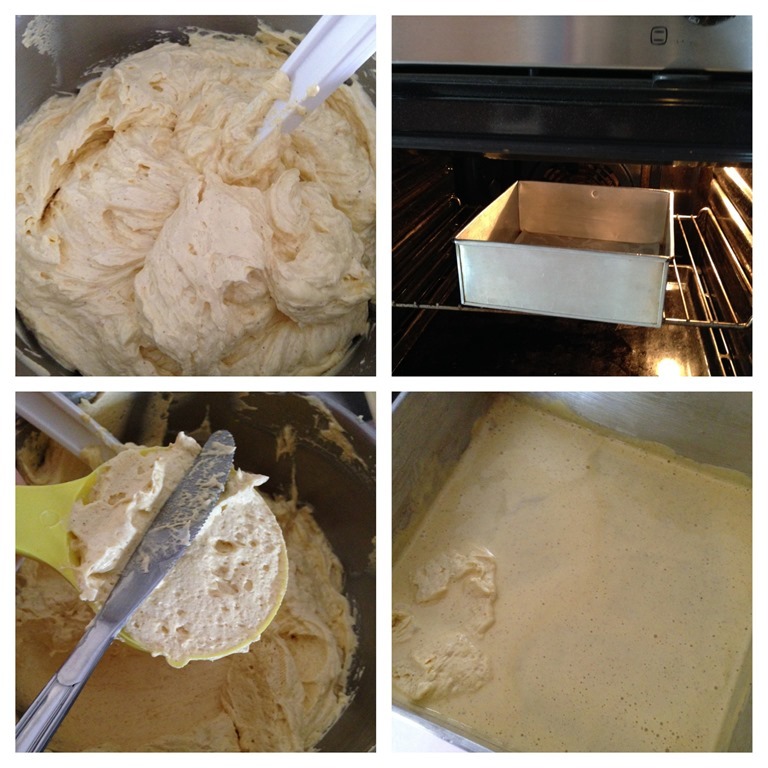 Once it browns, put another 1/2 cup of the batter to the baking tin, repeat the same process. If there are bubbles noted, use a toothpick to break it and use a icing smoother to lightly press the layer. Repeat the same for all the layers until all the batters are used. For the last layer, reduce the temperature for 160 degree Celsius and bake for 15 minutes. Keep an eye on each layer to ensure browning are even. For moister cake, you can brush the melted layer on each layer. However, I have by passed this step and come out with equally moist cake. 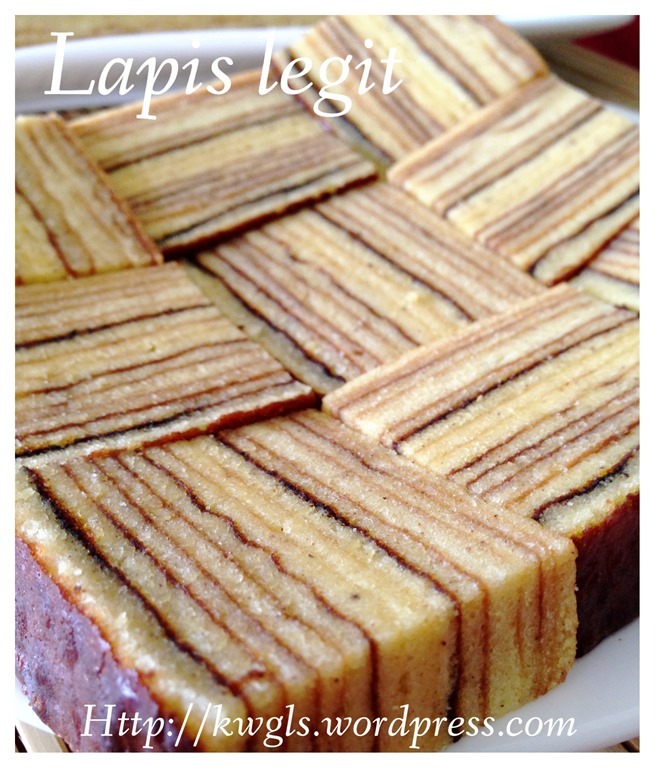 Pardon me for the poor layering but I am happy that this cake have 26 layers that meets the Wikipedia’s definition of kuih lapis. 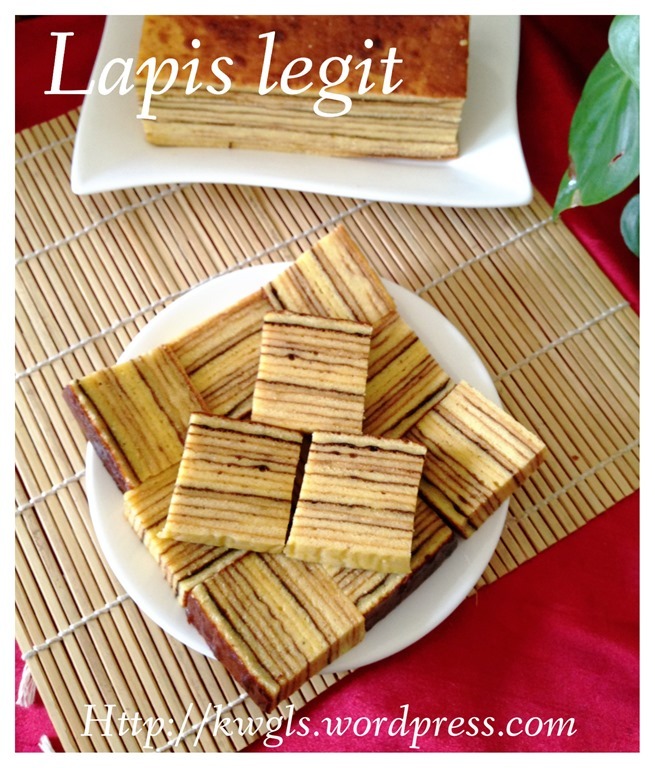 Lapis is not difficult to prepare if your oven temperature is operating normally. 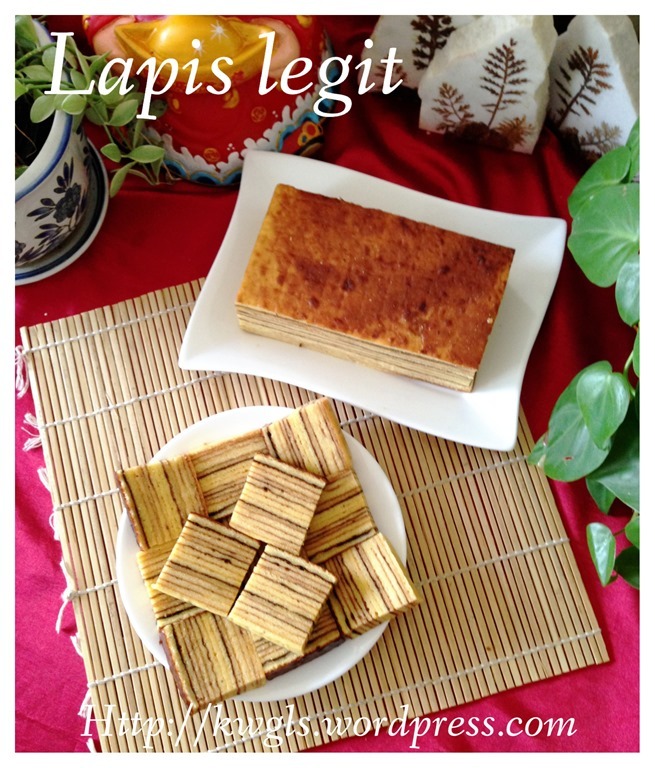 After seeing the ingredients, it is up to readers to decide whether to proceed to bake the lapis. What I can say is that it is a nice and delicious cake but everything have to be eaten in moderation. 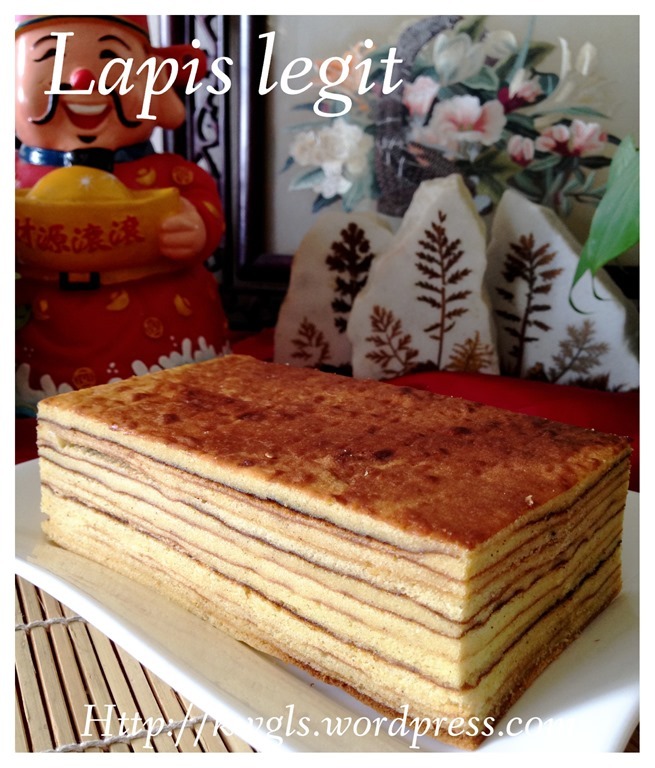 If you have a yearly ritual of buying lapis for Chinese New Year, this recipe will save you some money and what you get is this delicious cake plus sense of achievement. 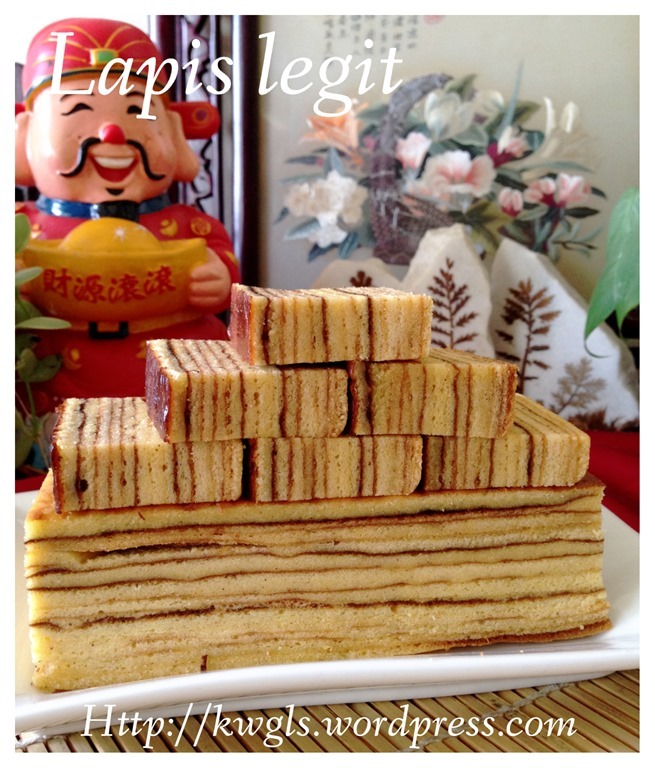 This entry was posted in Cakes and cookies, Chinese and Asian Cakes and Snacks, Chinese New Year 2014, Food Preparation Series and tagged 8, GUAI SHU SHU, Guaishushu, kenneth goh, lapis legit, postaday, Spekkoek, 印尼千层蛋糕，chinese new year 2014. Bookmark the permalink. tablespoons. 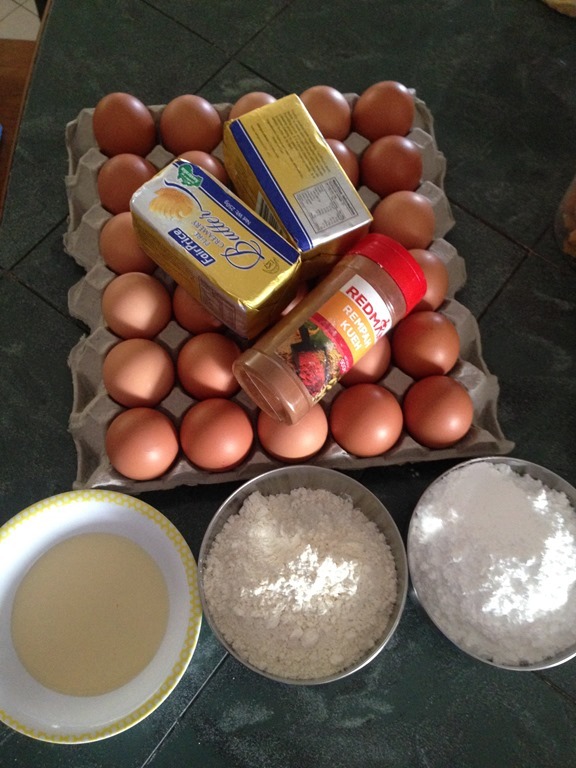 This is a big cake.You can start with about 1 tablespoon and gradually increase. Even at 1 tablespoon I found the taste is not very obvious.. I like to baked layer cake. And I always to baked it every year. My only problem is there will be layer that doesn’t stick together when I cut it. Do you know y? Can I use non-stick tin instead? It is on the reverse. 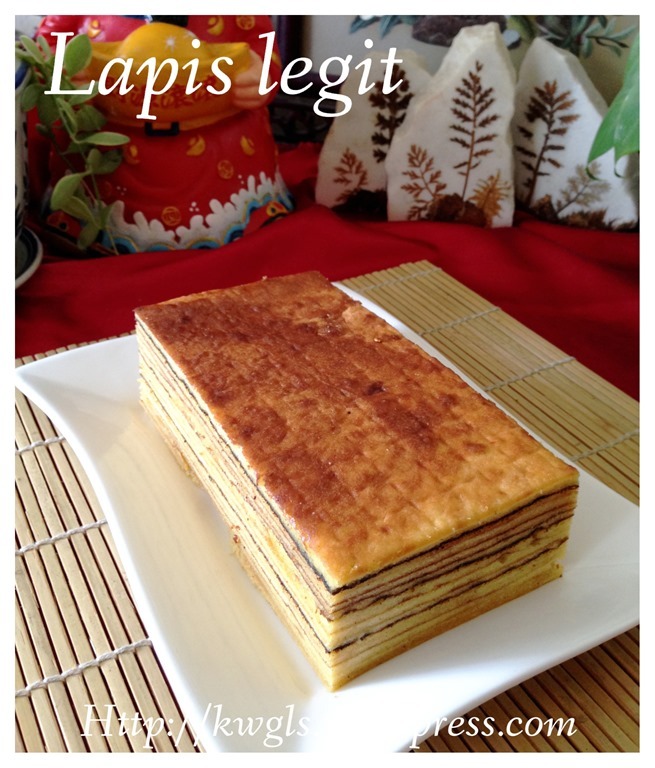 Lapis with egg white will be dry. 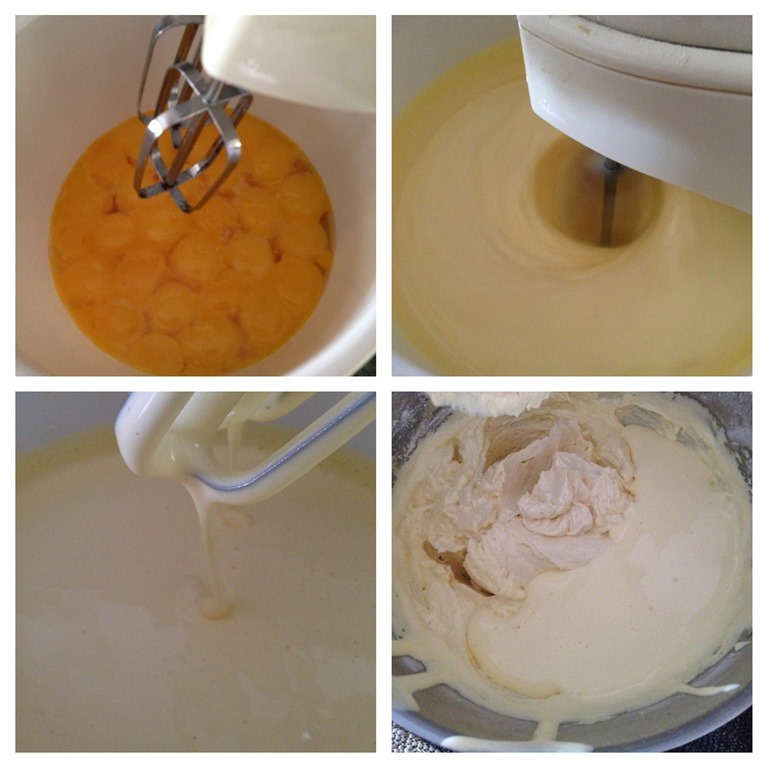 pure egg yolks is used is to make it and soft moist. Adding egg white to deep fried items or cookies will make it crispier but adding egg yolks will make it slightly damp. 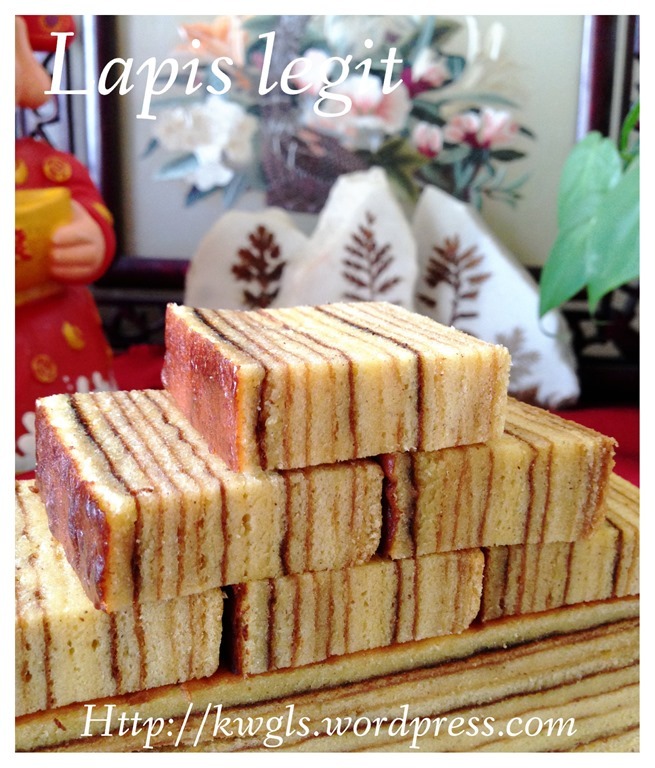 Will try your kueh lapis recipe and let you know the outcome. Have a blessed weekend! Thanks for your recipes. You are indeed my favourite recipe blogger! I’m considering to give it a go on this one but may I know what’s in ‘mixed spices’ as Im not sure if I can find it here in London. Is it the Chinese mixed spice? Thanks. Not Chinese mix spice.. it is basically comprises of nutmeg and cinnamon with the ratio 1:2.